Testing, Testing, 1 - 2 - 3..
Just wanting to see if I am getting this HTML thing... If you noticed, I have finally figured out how to make my blog a little bigger, and hopefully I can post larger images... notice, I said "hopefully!" There is light at the end of this tunnel... whew! ~S. It was a quiet Monday... Today at 1:11 p.m. I officially turned 33- and I did just what I wanted to do. Spent the evening with my lil guy and did some yard work. But don't worry- I treated myself to a starbucks eariler in the day and finished my evening with a delectable piece of cheesecake... & Ayden finally sang to me... it was the best. I did buy myself a pair of Margaritaville flops last week.. and yes, I photographed them but it is late so I will post them later. I love those shoes.. if you have never seen them, they are pretty cool, but more importantly - they are very comfortable! So, Happy Birthday to Me... Thanks Mom and Dad, love you both! ~S. So the other night, Ayden decides that he is batman... and "neeeds" to have his cape securely wrapped around his head. I know it really doesn't look much like batman to the adult eye, but he was having so much fun running, er, flying through the house laughing, "Look at me Mommy, I'm Batman!" And during those few moments who was I to tell him otherwise? ~S. Soooo... not only have I had the crazy issues of my website doing a total, unrecoverable crash and burn... ok so I deleted it by accident- but I have not been able to get my slide shows to work- at all.... they work on my computer and everyone kept telling me how easy it was- you just ... and voila! But no, see I don't like it when a simple task is, well, simple. I have the undying need to take a complete behind the scenes tour of the make up of a company and then I need to tear down their product and rebuild it so I understand the infrastructure and design. that is me- or so it would seem. Anyway after 2 hours on the phone with Rueben (yes we are on a first name basis at this point) we discovered that the reason my files were not loading through my FTP server into my site was because the music I was using came from a shortcut on my desk top and not from an actual folder- when the shortcut was created it was renamed as a link file so the sites were trying to locate an actual link... anyway so I am more versed with slide shows than I need to be but since I gained knowledge (a life time worth of the stuff) I am happy and not at all upset- can't say the same for hubby- he has missed his wife for the past few days and is glad to see the crazy woman who replaced her finally leaving! So here is my first slide show! (Remember Jim and Annette Endler from my trip in March to New Orleans? So sorry this has taken this long- really didn't think it would!) I am also addiing Tammy & Justin's wedding slide show. They were married on June 1, 2008 here in Jacksonville, FL. Enjoy! ~S. To all of our Fathers out there- Happy Father's Day! What a wonderfully, wet (and ohhh so cold day!) We decided this year to celebrate "spring style" and set off this morning to the very beautiful Silver Glen Springs in Salt Springs, FL- about 2 hrs outside of Jax- but well worth the drive! It rained on us alllll day- which is normally ok because you are in the water and wet, but when you are in the springs, which are cold, it makes warming up really hard. Poor Ayen was such a little trooper though- his lips were turning blue when we left- but he had so much fun and laughed all day. As soon as we changed him into dry clothes and cranked the car up, he was asleep- I said 10 min- 4 more min and we would have made it... :o) It was a great way to relax and stay away from editing today- so although it was technically a day to celebrate my really handsome hubby (and awesome daddy), I was the one who made out- I spent the day with my two favorite guys in a really beautiful place- and didn't have to cook... doesn't get any better than that! ~S. - Learn how to edit the site. - Edit yet more images. - Get my site back. - Share my site with everyone I do (and don't yet) know. - Get the new template. As you can see, it has been a fun-filled week (month and a half really!) in the Owens' house hold... But to be honest, I am sort of glad all of this took place. I feel like my new site is beginning to show more of my personality than the other one... I have learned a few things too... more about what NOT to do, but our journey through life takes us through many different places... it might be a mud puddle or who knows, you could be on a whole new life detour! Whatever your challenges, I urge you to grow and learn from them. You can't have any regrets if you do that. You can go onto stephowens.com to see my site, but PLEASE understand that I am still editing- there will be more images as I go along... Feel free to pass my name on (explaining please that it is in edit mode...) but def come and see what is new from time to time... Thanks to everyone for all of your prayers and encouraging words and thoughts! You don't know how much they have meant to me! Here is a little good luck charm I found today... :oD ~S. Wow... ok, so I was telling one of my cousins this am.. you have to be smarter than the equipment in which you are operating.... Somewhere between trying to do too much and never enough getting done, I deleted my website... but not to worry the wonderful staff at Bludomain is on it and will have it up and running soon. I asked everyone to pray for my business, but I guess I forgot to ask to pray for me- that I don't pound my computer with a hammer... hehe! No worries- I am keeping it cool and collective- just ready to understand how all of this FTP and such works. Good times... so keep checking with me today- I will be full force soon! ~S. So while out and about today on a power walk with my gal pal and biggest cheer-leader, Amber- I tried to come up with a million and one reasons why I am not ready to "flip the switch" and make my web site live... I have been working on it for weeks- I honestly thought when I started I would simply put a few images up (I mean really, I have so many floating around... ) but the problem quickly became that I did not feel that I had enough "really good" ones for my site. Call me crazy, but I am not your average photographer- a little nutty, sometimes funny, and make a really mean cheesecake kind of girl... so I began critically (over the top really) viewing my site- thinking, "OMG- what if other photographers look at this and think I am a really crappy photographer." And word to wise- if you REALLY think that, keep that to ya ok- yeah, thanks... :oD but if you have advice on how I might improve, I certainly welcome it as I love any tool that will help me to grow and become better at what I love. I said all of that to say that I couldn't think of enough reasons to not take the step so in taking her advice- as she sips on margaritas at the Jimmy Buffett concert in Raleigh this weekend- I set my website in motion.. So keep checking to see when it officially goes "live"! (Waiting on the site host as of now...) And if you do stop in, please let me know you were there.. I do love fan mail too! 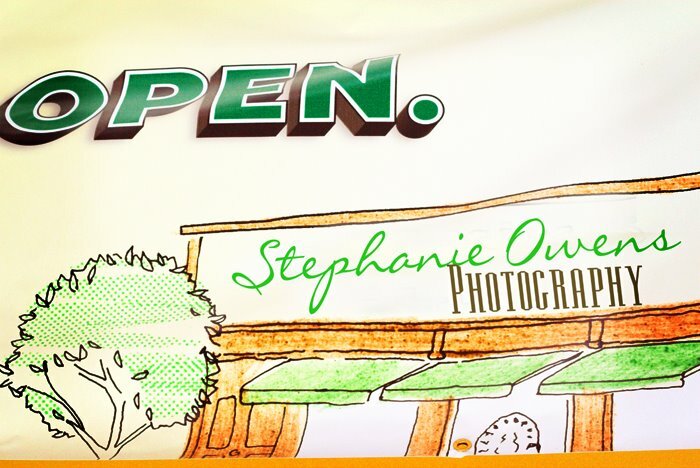 Stephanie Owens Photography See you soon! ~S. What a wedding day to remember! The day began hot and beautiful (just like the bride) and ended hot and steamy... (We had a thunder storm come through but it didn't stop anyone from celebrating the beautiful couple!) It was an absolute honor for me to have spent this day with them. Their families were very welcoming and helpful to me and I know Tammy and Justin are very blessed to have to have married into such a wonderful family . As they have just opened a new chapter in their life they are quickly preparing for yet another as they will be moving to Germany. Many blessings to you both and we pray God's protection and favor over you on the exciting new journies that lie ahead for you in your new life together! The following photos are just a sneak peek. (I couldn't stand the wait so I went home and did a quick edit on a few... :oD ) Enjoy!